"I see through the lies of the Jedi. I do not fear the dark side as you do. I have brought peace, freedom, justice, and security to my new Empire." Followers of the Dark Side know no limits in their quest for greed, ambition, and power. Those who would use the Force for dark gains will stop at nothing to accomplish their goals, and seek to dim the Spirit of Rebellion across the galaxy for their own selfish desires. 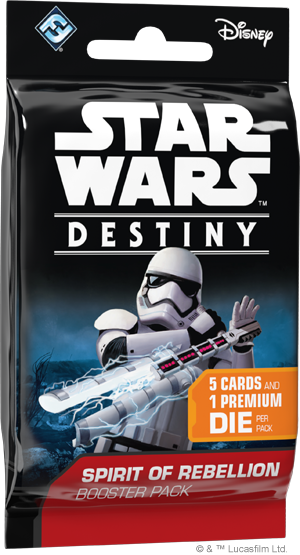 Today, we’re looking at the Blue Villains in Spirit of Rebellion, the newest booster set for Star Wars™: Destiny. 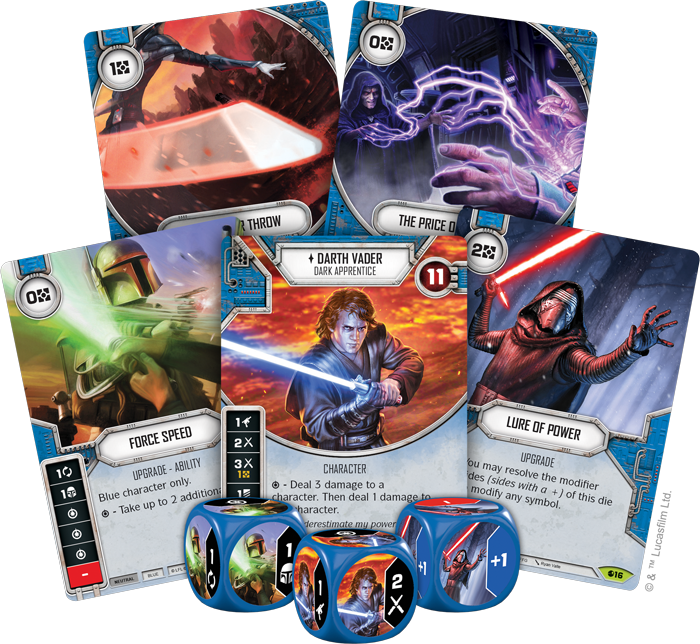 These followers of the Force use the Darkside to pursue power at any cost, trading health and even their allies for powerful, consistent effects. Few knew Darth Vader (Spirit of Rebellion, 10) when he was more man than machine. Uninhibited by his injuries sustained on Mustafar, the Sith Lord formerly known as Anakin Skywalker began his service to Emperor Palpatine by hunting down his former comrades at the Jedi Temple on Coruscant. For years, Palpatine schemed to turn Vader to the dark side, and in exchange received a pupil with unlimited potential. 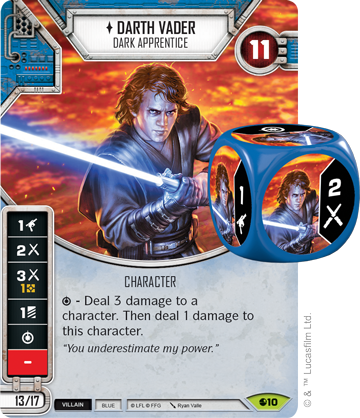 This early version of Darth Vader comes to Star Wars: Destiny with untamed power, a special symbol that allows you to deal three damage to a character, at the cost of a damage to Vader. His other sides feature one side of ranged damage, two sides of melee, and a discard symbol, making him a constant threat to your opponent. An elite Vader can be paired with Asajj Ventress (Spirit of Rebellion, 9) for 29 points to create a team that will constantly be putting pressure on their opponent. Asajj’s passive power allows you to force an opponent to discard an additional card whenever they discard to reroll their dice. This can limit your opponent’s options and resources while you deal out massive damage with this pair of Blue Villain characters. Only the most capable of soldiers qualify to become an elite protector of Emperor Palpatine, those who do are welcomed into the ranks of the Royal Guard (Spirit of Rebellion, 12). Draped in crimson robes and helmets, the Guard's anonymous faces remain ever vigilant for threats to the Emperor they serve. The Royal Guard's die features two sides showing melee damage, one showing modified melee damage, and two sides with shield symbols. With the “Guardian” keyword and ample opportunity for shields, the Royal Guard can add a defensive edge to your team, protecting other villains from harm while bolstering their health. 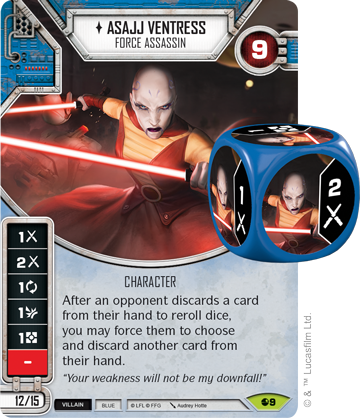 A Royal Guard can be teamed with the already revealed Palpatine (Spirit of Rebellion, 11) for an even 30 points. The team is both thematic and effective, the guard providing shields and melee damage while Palpatine tears your opponents apart with his passive ability and multiple opportunities for ranged damage. 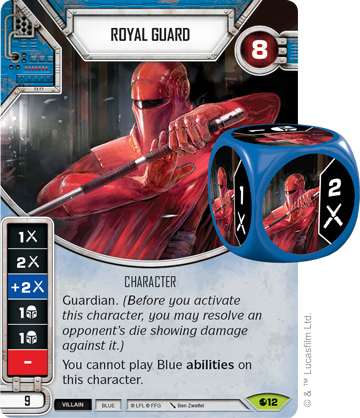 While the Royal Guard can’t have blue abilities played on them, their offensive capabilities can be boosted by a Lightsaber Pike (Spirit of Rebellion,15). The pike's die features a melee damage symbol, two modified melee symbols, a shield and a resource. This can make a Royal Guard doubly effective, giving them the opportunity to do even more melee damage while providing additional shields and the ability to give you a resource. 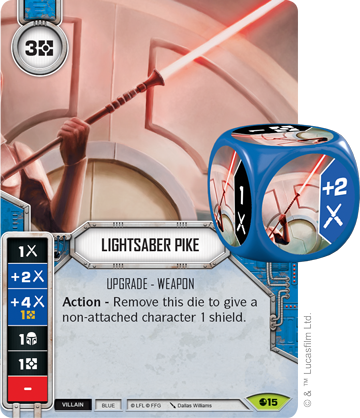 Even if you roll a Lightsaber Pike’s blank side or a modified damage you can't use, you can remove the die as an action to give a non-attached character a shield, making it a weapon that’s nearly always useful. The Force is a powerful ally, allowing those who wield it to react to threats with incredible reflexes. 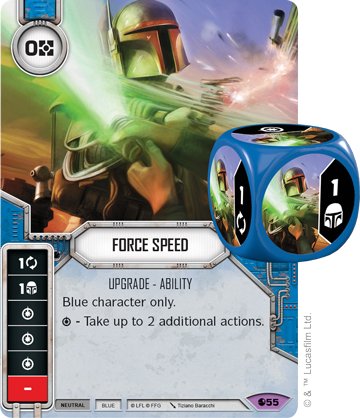 Force Speed (Spirit of Rebellion, 55) is one of the most consistent die in Star Wars: Destiny, and that offers near unlimited potential. With a special ability symbol on three sides of the die that give a player the opportunity to take up to two additional actions, you can activate a character then resolve their die, or resolve all of your melee and ranged damage on a single turn, the possibilities are endless. A blank side, a focus symbol and a shield symbol round out the die, creating a supportive card for the cost of zero resources. Force Speed is limited to blue characters, but it is sure to be one of the most powerful tools in their arsenal. The power of the Dark side is strong, able to shape your fate with die that give you the results you want. Spirit of Rebellion has a theme of more consistent die, but that means more than just multiple sides showing the same symbol. 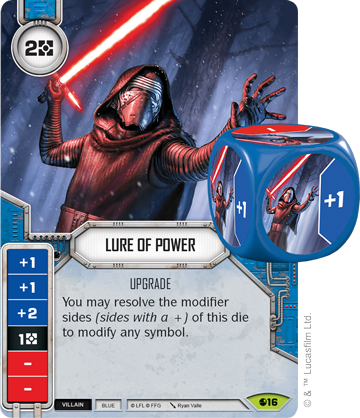 Lure of Power (Spirit of Rebellion, 16) features three die sides showing a modifier that can be used with any symbol as well as a fourth side showing a resource. With two blanks side, the upgrade can lead you to ruin, but the Lure of Power is something Blue Villains find difficult to resist, and general modifiers provide limitless potential. Those who follow the dark side give in to their hate, and turn it into power. 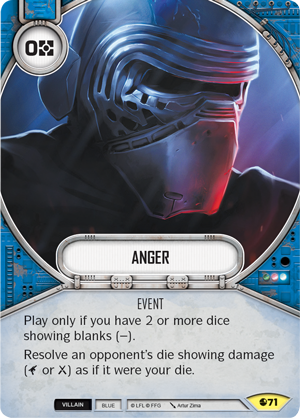 Anger (Spirit of Rebellion, 71) allows you to turn your blank die into fuel for damage. If you have at least two die showing blanks, you can resolve one of your opponents die showing damage as if it were your own, turning their own power against them. If you have Anger on your sides, it ensures that even your blank die will be useful in your battles, providing even more consistency for Blue Villains. 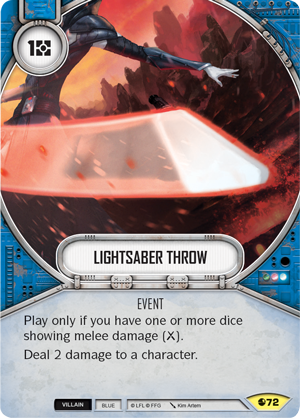 You can continue to pile on the damage with Lightsaber Throw (Spirit of Rebellion, 72), an event that allows you to deal two damage to a character provided you already have die showing melee damage, which for Blue Villains, is no obstacle at all. With all the tools Blue Villains have at their disposal, they are not ones to tolerate those who fail to meet their standards. 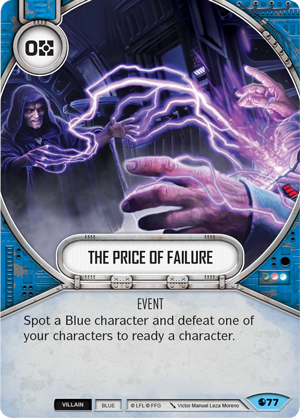 The Price of Failure (Spirit of Rebellion, 77) allows you to spot a Blue character and defeat one of your own characters to ready another. This can be useful if one of your characters is already on the brink of defeat, such as a Royal Guard who has given all they can to their duty. 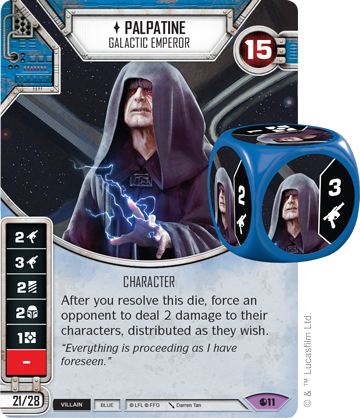 This can allow a character with powerful die like Palpatine to activate a second time, near the end of a round when an opponent has already exhausted all of their options, the sacrifice of one of your characters can mean victory for Blue Villains who will not make the same mistakes they did. The Dark Side is strong, and those who fall to its lure will stop at nothing in their pursuit of power. Damaging themselves and their allies is no cost when the reward is power enough to defeat anyone who stands in their way. Join the Dark Side and order Spirit of Rebellion (SWD04) from your local retailer when it releases this May!